Kenzie Oefelein is the Senior PATH Instructor at Turning Point. In fact she’s been coming to the barn for more than 12 years – first as a volunteer, then Herd Manager, then Instructor. Now a grant from AmeriCorps – Oklahoma in Action – is funding her expertise as Volunteer Coordinator. She trains, schedules, coaches and coordinates nearly 130 volunteers who lead horses and sidewalk in sessions, feed and doctor horses on the feed team and exercise or work with horses on the schooling team or just love and groom one specific horse in the sidekick program. 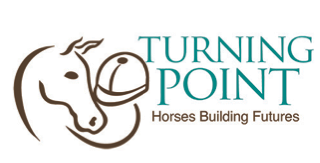 In addition, she coordinates the work of special groups who come to Turning Point to clean tack or help prepare for special events like Special Olympics. Here is the Perkins 4-H Club cleaning tack before Special Olympics. And when it comes to celebrating volunteers with a movie night or special dinner or even a chance to dress up for classes on Halloween, that’s Kenzie too. If you’d like to join the team of volunteers that makes Turning Point such a great place, just email Kenzie.